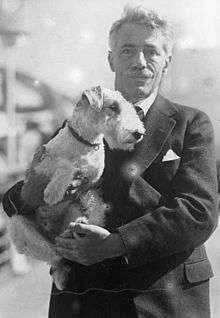 This article is about Austrian violinist and composer Fritz Kreisler. He is not to be confused with Fritz Crisler. Friedrich "Fritz" Kreisler (February 2, 1875 – January 29, 1962) was an Austrian-born violinist and composer. One of the most noted violin masters of his or any other day, and regarded as one of the greatest violin masters of all time, he was known for his sweet tone and expressive phrasing. Like many great violinists of his generation, he produced a characteristic sound which was immediately recognizable as his own. Although it derived in many respects from the Franco-Belgian school, his style is nonetheless reminiscent of the gemütlich (cozy) lifestyle of pre-war Vienna. Kreisler was born in Vienna, the son of Anna (née Reaches) and Samuel Kreisler, a doctor. Of Jewish heritage, he was however baptised at the age of 12. He studied at the Vienna Conservatory and in Paris, where his teachers included Anton Bruckner, Léo Delibes, Jakob Dont, Joseph Hellmesberger, Jr., Joseph Massart, and Jules Massenet. While there, he won the "Premier Grand Prix de Rome" gold medal at the age of 12, competing against 40 other players, all of whom were at least 20 years of age. He made his United States debut at the Steinway Hall in New York City on November 10, 1888, and his first tour of the United States in 1888–1889 with Moriz Rosenthal. He then returned to Austria and applied for a position in the Vienna Philharmonic, but was turned down by the concertmaster Arnold Rosé. As a result, he left music to study medicine. He spent a brief time in the army before returning to the violin in 1899, when he gave a concert with the Berlin Philharmonic conducted by Arthur Nikisch. It was this concert and a series of American tours from 1901 to 1903 that brought him real acclaim. In 1910, Kreisler gave the premiere of Sir Edward Elgar's Violin Concerto, a work commissioned by and dedicated to him. He served briefly in the Austrian Army in World War I before being honourably discharged after he was wounded. He arrived in New York on November 24, 1914, and spent the remainder of the war in America. He returned to Europe in 1924, living first in Berlin, then moving to France in 1938. Shortly thereafter, at the outbreak of World War II, he settled once again in the United States, becoming a naturalized citizen in 1943. He lived there for the rest of his life, giving his last public concert in 1947, and broadcasting performances for a few years after that. On April 26, 1941, he was involved in a serious traffic accident. Struck by a truck while crossing a street in New York, he suffered a fractured skull and was in a coma for over a week. In his later years, he suffered from not only some hearing loss but also sight deterioration due to cataracts. Kreisler died of a heart condition aggravated by old age in New York City in 1962. He was interred in a private mausoleum in Woodlawn Cemetery, The Bronx, New York City. Kreisler wrote a number of pieces for the violin, including solos for encores, such as "Liebesleid" and "Liebesfreud". Some of Kreisler's compositions were pastiches ostensibly in the style of other composers. They were originally ascribed to earlier composers, such as Gaetano Pugnani, Giuseppe Tartini and Antonio Vivaldi, and then, in 1935, Kreisler revealed that it was he who wrote the pieces. When critics complained, Kreisler replied that they had already deemed the compositions worthy: "The name changes, the value remains", he said. He also wrote operettas, including Apple Blossoms in 1919 and Sissy in 1932, a string quartet, and cadenzas, including ones for Brahms's D major violin concerto, Paganini's D major violin concerto, and Beethoven's D major violin concerto. His cadenzas for the Beethoven concerto are the ones most often played by violinists today. Kreisler performed and recorded his own version of the first movement of Paganini's D major violin concerto. The movement is rescored and in some places reharmonised, and the orchestral introduction is completely rewritten in some places. The overall effect is of a late-nineteenth-century work. 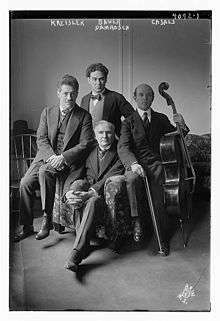 Kreisler owned several antique violins crafted by luthiers Antonio Stradivari, Pietro Guarneri, Giuseppe Guarneri, and Carlo Bergonzi, most of which eventually came to bear his name. He also owned a Jean-Baptiste Vuillaume violin of 1860, which he often used as his second violin, and which he often loaned to the young prodigy Josef Hassid. On recordings, Kreisler's style resembles that of his younger contemporary Mischa Elman, with a tendency toward expansive tempi, a continuous and varied vibrato, expressive phrasing, and a melodic approach to passage-work. Kreisler makes considerable use of portamento and rubato. The two violinists' approaches are less similar in big works of the standard repertoire, such as Felix Mendelssohn's Violin Concerto, than in smaller pieces. A trip to a Kreisler concert is recounted in Siegfried Sassoon's 1928 autobiographical novel Memoirs of a Fox-Hunting Man. Kreisler's work has been reasonably well represented on both LP and CD reissues. Original masters were made on RCA Victor and HMV. His final recordings were made in 1950.
attrib. Vivaldi, RV Anh. 62 (composed by Kreisler) Violin Concerto in C major, with Donald Voorhees, RCA Victor Orchestra, rec. May 2, 1945. Rhapsody (1944) – musical – composer. Kreisler, Fritz (1915). Four Weeks in the Trenches. Boston, New York: Houghton Mifflin. OCLC 1161448. ↑ Morgenstern, Hans (1 January 2009). "Jüdisches biographisches Lexikon: eine Sammlung von bedeutenden Persönlichkeiten jüdischer Herkunft ab 1800". Lit – via Google Books. ↑ Stepansky, Paul E. (1 January 1986). "Freud, Appraisals and Reappraisals: Contributions to Freud Studies". Analytic Press. ISBN 0-88163-038-1 – via Google Books. 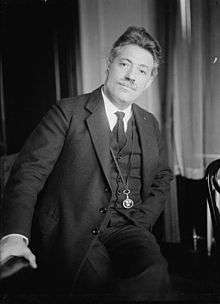 ↑ "Fritz Kreisler – Biography & History – AllMusic". AllMusic. ↑ "The world of music". The Independent. Dec 14, 1914. Retrieved July 24, 2012. "John McCormack, Great Irish Tenor, in Houston Thursday". The Houston Post. 5 Dec 1915. p. 29 – via Newspapers.com. Wikimedia Commons has media related to Fritz Kreisler.